Part 16: Could the Mercedes Benz 500I have been stopped in time? Part 18: The 1995 '500' - Did the Mercedosaurus bite its masters after all? Acknowledgements: The creation of this appendix was made possible thanks to the much appreciated cooperation of Team Penske members Chuck Sprague and Nigel Beresford who supplied data from the factory records they had available. Also thanks to Patrick Morgan for providing further assistance. Once the data about how the different chassis had been used during 1994 became available it became possible to have a more detailed glance at the share of each individual chassis in Team Penske's unbelievable achievements that season. It appears that just about every chassis had a remarkable history, so let’s have a look on that. For example, even though 1994 was an even year by far the most races were driven by cars with an odd chassis number. Out of 48 starts the even-numbered cars took only four starts! There were nine different chassis built. Seven of them were built and made available in the Month of May, the highlight period of the year. The additional two cars were added to the team after May so weren't part of the 265/E-500I legend. Let’s take a closer look at the different cars and the role they played in the creation of the legend. The prototype was one of the primary battlewagons, earning notable distinctions. It was the only car already being tested in December 1993. Among all PC23s this was the only car that participated in every race during the 1994 season. It started life as Al Unser’s race car in the first three races of the season, Unser winning Long Beach with it. 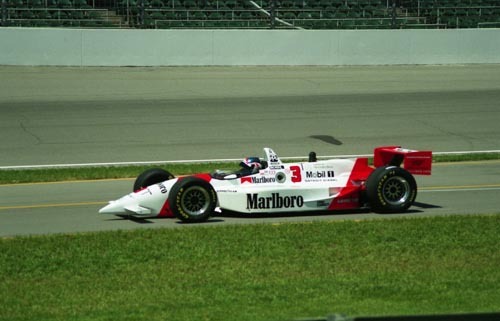 Entered as a backup at Indianapolis (31T) it was pressed into service for Paul Tracy after he crashed his primary car. From then on, Tracy used the car for the remainder of the season. He was fastest qualifier at Elkhart Lake and Laguna Seca and was victorious with the car in Detroit, Nazareth and Laguna Seca. Of all the used PC23s it was the only car shared among the drivers that won races with different drivers at the wheel. Apart from races, 001 was a much-used car in test sessions as well, the majority of those taking place in the build-up to the season and during the race season. Also after the season finished it was used for testing. Even in early 1995 it was still called upon. That makes this the only PC23 that in its years of duty with the factory was used in three different calendar years. PC23-001 was certainly one of the main battlewagons among the PC23s that contributed to the legacy of the PC23 type. This car started life as a back-up in the first half of the season. At Indianapolis it ran in practice as 3T. Its most extensive use was after the first weekend of qualifying, during the second week of practice. It was used for two races by Fittipaldi in Toronto and Michigan and finished in the points on both occasions. Discarded for the next event it returned as a back-up for two more races although it wasn't entered in the last three races of the season. This chassis participated in many test sessions, before and during the season but none of those took place after the season had ended. In that respect it was one of the cars that contributed largely to the PC23 legacy, yet doing lots of that away from the public eye. This car started life as Emerson Fittipaldi’s primary car in the first four races of the season. Second in the season opener, winning at Phoenix, retiring in Long Beach and crashing out of the lead at Indianapolis, the car wasn't used in race weekends for the next four races, In the second half of the season it appeared in six of the eight remaining races, acting as a back-up. This chassis was also used for a handful of in-season test sessions but not as frequent as were 001 and 002. This particular chassis has the most unusual distinction of all PC23s, in that in February, March, April and early May it served as the test hack for the Ilmor 265/E-500I engine at both Nazareth and Michigan. It ran at Michigan as late as early May, during opening weekend. After that it was brought over from Michigan to the Speedway as one of the three backup cars, numbered 2T and appearing for the first time after the qualifying weekend. With Indy won and no further action for the 500I engine required 004 was converted to Ilmor/D specification and was one of the two available back-up cars that were entered for each remaining race for the rest of the season. Even though it was entered for all remaining 12 races, making a grand total of 13 times, it was never used in a race! It was, however, the car that laid the foundations for the success at Indianapolis. According to the Penske data files, all test sessions with the car were done with the 265/E-500I engine if we include the practice period at Indy as a test session as well. Once practice at Indy was over the car wouldn’t be used for test purposes anymore. Nevertheless, if one is inclined to refer to one of the PC23s as 'the' Penske-Mercedes, PC23-004 is the most likely candidate. 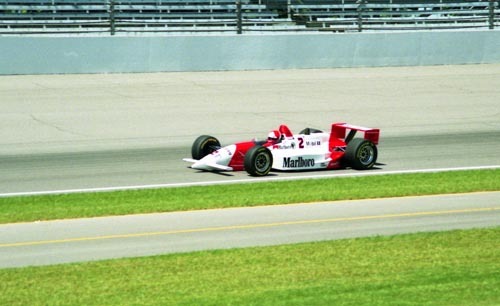 Of all the PC23s built that existed before June 1st, 1994, this is the only chassis that was never fitted with the 265/E-500I engine and wasn't used at Indianapolis in May that year. It started out life as Paul Tracy’s car at both Australia and Phoenix, retiring in both races although Paul was fastest qualifier at Phoenix with the car. It saw no action at either Long Beach or Indianapolis. It was, however, the car that was used in a late-May test session at Milwaukee, between Bump Day and Carb Day. It thus contributed to the first of five Penske triples that would follow after Indianapolis, Milwaukee being the first of those. It was also part of this triple since PC23-005 became Fittipaldi’s primary car for the rest of the season. He used it in nine of the 12 races after Indy, starting at Milwaukee. Fittipaldi scored two more poles with the car yet never won a race in it. With a total of 11 races it was the third-most used car in events that year. The late-May test at Milwaukee was the only test session in which the car was ever involved. Of all the PC23s built that existed before June 1st, 1994, this is the least used of them all, unless one would nominate PC23-004, that doesn't have a single race start to its name. 006 started its career as Paul Tracy’s new car from Long Beach on, where Paul put it on pole but retired from the race. At Indianapolis it was entered as 3, Paul’s primary ride, but he crashed the car on “Fast Friday”, the day before Pole Day. Thereafter it was no longer seen during race weekends. To make it more painful, it was never used in any test session either so it has become, if anything, the least glorious of all PC23s. Enrolled in the team during the Month of May, this particular chassis appears to do the reputation of its chassis number full justice: lucky number 7! It needed that lucky number to counter the reputation of the number of races it eventually did: 13! Entered for the first time at Indianapolis as Al Unser Jr’s primary ride, it was the car that Unser raced in the remaining events of the year. Pole and race winner at Indianapolis with 265/E-500I power, followed by three more poles at Portland, Cleveland and Mid-Ohio. Six more race wins at Milwaukee, Portland, Cleveland, Mid-Ohio, New Hampshire and Vancouver. With ease the most successful of all the PC23 chassis and effectively the car that was the CART Championship drive of 1994. With its 13 starts, this is the second-most used car of all PC23s. The car was used in a test session after the 1994 season had ended, its lone appearance in a test session that year. 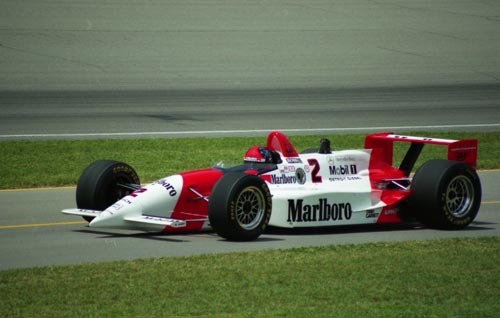 PC23-007, however, was one of the very few cars also used by Team Penske in 1995 when it appeared on May 15th for test sessions during practice for the Indy 500 in order to provide data for sorting out the difficulties with the 1995-type PC24. It wasn't fast enough to contribute to any solution to these problems. 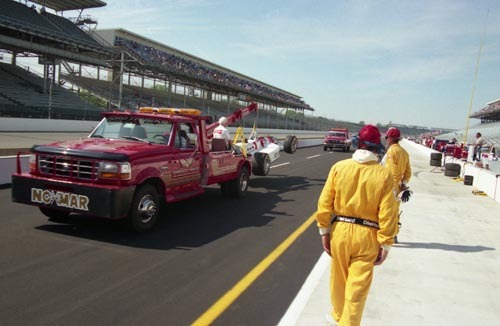 As late as June ’95 the car was still used in a test session before finally being retired, to be restored in its winning “Indy 500” specifications. 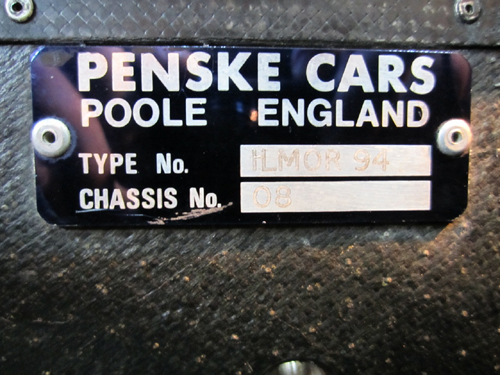 This chassis was delivered to the team in June 1994 and was primarily used in test sessions. It appeared on a race weekend only once, at Cleveland where it was Fittipaldi's third different race car of the season. He retired from the race. The car was used in a few test sessions during the 1994 season and two more once the season had ended. This was one of the cars used by Bettenhausen Racing during 1995, although its exact history during the year is unknown. The car is currently being restored by Patrick Morgan and he found out that this particular car must have been the car that was used by Gary Bettenhausen in the '96 US500, making this the last of the PC23s that ever started a race. Progress on the restoration on the PC23-008 as well as being interesting sources of info and pictures on the PC23 in general can be found elsewhere on the Internet, such as on Flickr and on autosport.com. This was another new car supplied to the team during the second half of the season but it was never used in race weekends by the team. It also appears as if the car was never used during any test sessions held in 1994, even though it was used for some testing in early 1995. This was one of the cars used by Bettenhausen Racing during 1995, even though its exact history during that year is unknown. As the table shows, Tracy and Unser stopped changing cars after Indianapolis. In the same period Fittpaldi used three different cars but most often he raced 005. However, there is a curious observation one could make with regards to the finishing results. 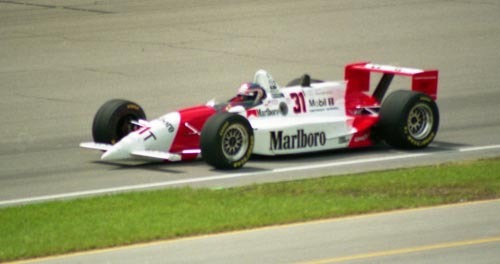 The five triple victories by Team Penske in 1994 were achieved in 12 events. Chassis 001 and 007 were used in all of those events, with chassis 005 being used nine times. But all of those five triples were achieved in the nine races in which 001, 005 and 007 were used. Despite the stupendous post-“500” successes of the PC23, its crowning moment must be Indianapolis when it ran with the Ilmor 265/E engine. Appendix 2 contains a number of data and stories about the various chassis used at Indy. A similar overview like the one presented above showing the 1994 chassis allocation can also be made for the seven chassis that existed in May 1994, the more since some of these chassis were active at other locations than the Indianapolis Motor Speedway. This gives an interesting impression of how busy Team Penske was in that memorable period of time.